The Gonzales Joe Bailey Memorial Committee is pleased to announce that it has commissioned award-winning artist/sculptor Lisa Perry to create a portrait bronze statue of American Quarter Horse Foundation Sire Gonzales Joe Bailey (P-4). This bronze masterpiece will serve as a grand memorial to this beloved Quarter Horse and will rest atop a granite base marking his future grave-site which is to be located at the J.B. Wells Park, a new multi-use equestrian and agricultural arena complex located in Gonzales, Texas. A widely-respected, highly recognized Texas artist and horsewoman with strong ties to the American Quarter Horse Association, Ms. Perry holds a Bachelor of Arts degree in Fine Arts from Montana State University and has worked under such illustrious, renowned sculptors as Fritz White, Ron Zahoric, George Lundeen, Grant Speed, Herb Mingery, Mehl Lawson, Lincoln Fox, and Ed Fraughten. Among her many commissioned projects as a sculptor, Ms. Perry has been commissioned by the American Quarter Horse Association to recreate a 1 1/2-life-sized bronze sculptor of Refrigerator, the highest earning World Champion quarter horse of the AQHA. This majestic statue will be proudly positioned in front of the Heritage Center and Museum of the American Quarter Horse Hall of Fame in Amarillo, Texas. Perrys other popular and distinguished sculptures are numerous and include a heroic, life-sized depiction of Bill Pickett for the city of Ft. Worth, Texas, as part of the citys sesquicentennial project. 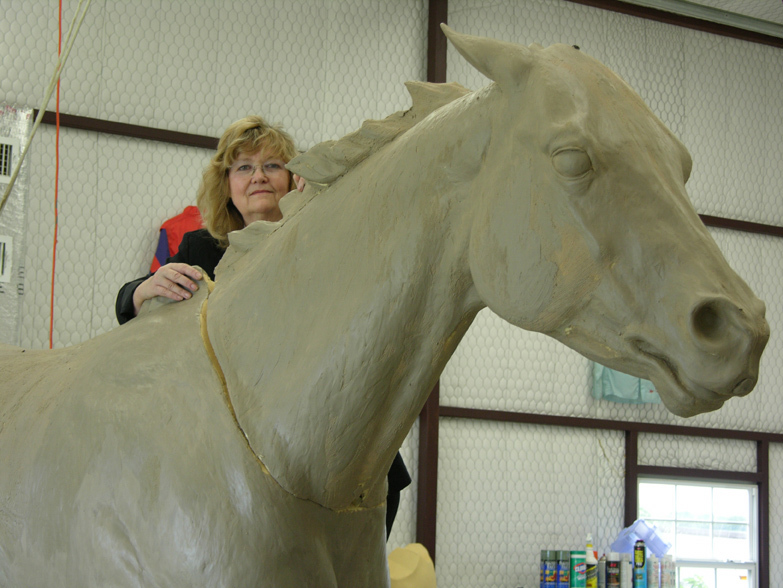 Perry was also selected from hundreds of entries in a national competition to sculpt a life-sized bronze of an extinct Giant Short-Faced Bear as well as a life-sized bronze of an extinct Bision Antiquus for the Lubbock Landmark State Historical Park, and she created a 1 _-life-sized bronze of racehorse Alysheba for the Lone Star Park of Grand Prairie, Texas. Ms. Perry was also one of five finalists chosen to sculpt a major piece for the museum at Texas Tech University and was a finalist in the selection of an artist chosen to create a sculpture for the American Paint Horse Association. She was also one of five finalists in a competition for the creation of a model for the Teri Jackson Tourist Information Center Art Project. Ms. Perrys commissions from Lone Star Park of Grand Prairie, Texas, also received the Lone Star Derby Award, the Jockey Challenge and the Texas Mile. Ms. Perry has also been awarded commissions from the American Quarter Horse Association, the Texas Horse Racing Association, the National Snaffle Bit Association, the national Paso Fino Horse Association, the Pacific Coast Quarter Horse Association, the Diamond Classic Futurity, and the Travis County Livestock Board. Ms. Perry has also recently been asked to design a signature piece for the Race for Education, a scholarship program for racetrack children. Among her numerous awards are those from the American Quarter Association, a Founders Award and Best of Show from the American Academy of Equine Artists, invitation-only membership in the American Academy of Equine Artists, The George Phippen Family Award, Best of Show Metal Sculpture from National Ducks unlimited, Governors Award for Montana Artist of the Year, Best of Show and Special Award of Excellence from the Harness Tracks of America, and Best of Show in the National Cowgirl Hall of Fame. Ms. Perrys bronze sculptures have appeared three times on the covers of The Quarter Racing Journal and have also appeared on the Paint Horse Journal, Illinois Standardbred, Equine Images, Oklahoma Thoroughbred Breeders magazine, The Chronicle of the Horse, Track magazine and the Bucking Chute Gazette. Feature articles on her work have also appeared in the Texas Thoroughbred magazine, the Quarter Racing Journal, Equine Images, The Virginian, the Ft. Worth Star Telegram, and numerous other publications. She has also been featured on the ESPN Network show Americas Horse and mentioned in a recent article on Gonzales Joe Bailey in the AQHA publication American Horse magazine. Ms. Perrys museum exhibitions include those at the Kentucky Derby Museum, the AQHA Heritage Foundation Museum, the Museum of the Hounds and Hunt, the International Museum of the Horse at the Kentucky Horse Park, the Madison-Morgan Cultural Center, and the Appleton Museum. Ms. Perry not only brings with her a wealth of experience and awards to this project, she also brings a heart-felt desire to share her love of horses and equine events and organizations. Together with her husband, Ms. Perry has raised Quarter Horses for twenty-five years and has been sculpting horses for the AQHA since 1989. As part of the commission from the Gonzales Joe Bailey Memorial Committee, Ms. Perry will first sculpt two maquettes (small statues) of Gonzales Joe Bailey which will be cast in bronze as limited editions and offered to raise funds for the Gonzales Joe Bailey memorial project. Click here for pictures of the Bronze in progress!